Essay by Mattias Boström. 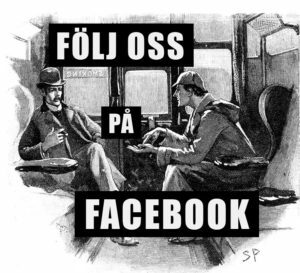 Originally published in The Baker Street Journal, number 4, 2008. “I do not know what I may appear to the world, but to myself I seem to have been only a boy playing on the sea-shore, and diverting myself in now and then finding a smoother pebble or a prettier shell than ordinary, whilst the great ocean of truth lay all undiscovered before me.” These are the words of Sir Isaac Newton, father of modern science and a good example of scientific humility. Dr. James Mortimer, country practitioner in Grimpen, Dartmoor, may very well have been influenced by Newton, since, at the beginning of The Hound of the Baskervilles, he describes himself as “a picker-up of shells on the shores of the great unknown ocean.” Mortimer seems actually to have been thinking of himself more as a scientist than a doctor. But above all else, he thought of himself with humility. Not only does he describe himself in a humble way, he also avoids mentioning the truth about his genius. In fact, this country practitioner was, beyond all doubt, one of the foremost in his field in the whole of England. Mortimer, James, M.R.C.S., 1882, Grimpen, Dartmoor, Devon. House-surgeon, from 1882 to 1884, at Charing Cross Hospital. Winner of the Jackson Prize for Comparative Pathology, with essay entitled “Is Disease a Reversion?” Corresponding member of the Swedish Pathological Society. Author of “Some Freaks of Atavism” (Lancet, 1882), “Do We Progress?” (Journal of Psychology, March, 1883). Medical Officer for the parishes of Grimpen, Thorsley, and High Barrow. When Sherlock Holmes calls him “Dr. James Mortimer” he is quick to interrupt with a “Mister, sir, Mister—a humble M.R.C.S.” These four letters mean that he had done only the surgical part of his qualification to practice and he still had to go through the medical half. In itself this shouldn’t have stopped him from calling himself a doctor; rather it seems to be a sign of how he constantly reminds the surrounding world of his humility, almost as a mantra. Mortimer describes himself as a “dabbler in science.” But just a moment later he shows how deeply he is committed to scientific interests. Not only does he covet Holmes’s dolichocephalic skull and its well-marked supra-orbital development, but he also actually asks for permission to run his finger along the parietal fissure of Holmes’s head. Such a person is not a dabbler in science; he is a man who puts science before good manners! “You are an enthusiast in your line of thought,” as Holmes puts it. How can we then know that Mortimer is such an eminent scientist if he at the same time, deliberately or not, succeeds in hiding it? The truth is to be found in the short entry in the Medical Directory. As far as the education and the years as house-surgeon are concerned there is nothing that differs from the usual. To get papers published in the Lancet and the Journal of Psychology is more remarkable, but not totally impossible for an intelligent student. The Jackson Prize for Comparative Pathology is also a fine achievement, but what puts him in the absolute elite of the British medical profession is something else: the short mention that he is a corresponding member of the Swedish Pathological Society. Dating The Hound of the Baskervilles is, at first sight, easy. Holmes mentions that five years have passed since 1884. However, Sherlockian chronologists have noted that other events in the Canon make 1889 an impossible choice of year and have instead suggested different years from 1886 to 1900. Whichever year you pick there is a problem with the membership in the Swedish Pathological Society: there was no such society. In August 1917, when the professor of pathology Ulrik Quensel welcomed his colleagues to a meeting in which they would found the first Swedish pathological society, he greeted only eight persons: these were all the pathologists in Sweden at that time. Even in Mortimer’s own country there wasn’t such a society at the turn of the century. The Pathological Society of Great Britain and Ireland was established in 1906. To find the real Swedish Pathological Society we have to consider the source where the society is mentioned, the Medical Directory. To compile this kind of who’s who volume would be impossible unless those included contributed the necessary facts. So the piece of information that Mortimer was a corresponding member of this foreign society probably came from Mortimer himself. And if Mortimer believes himself to have become a corresponding member of the society in his capacity as pathologist it is easy to understand that he may remember incorrectly the proper name of the society, especially if he, humble as he was, didn’t value the membership especially highly. 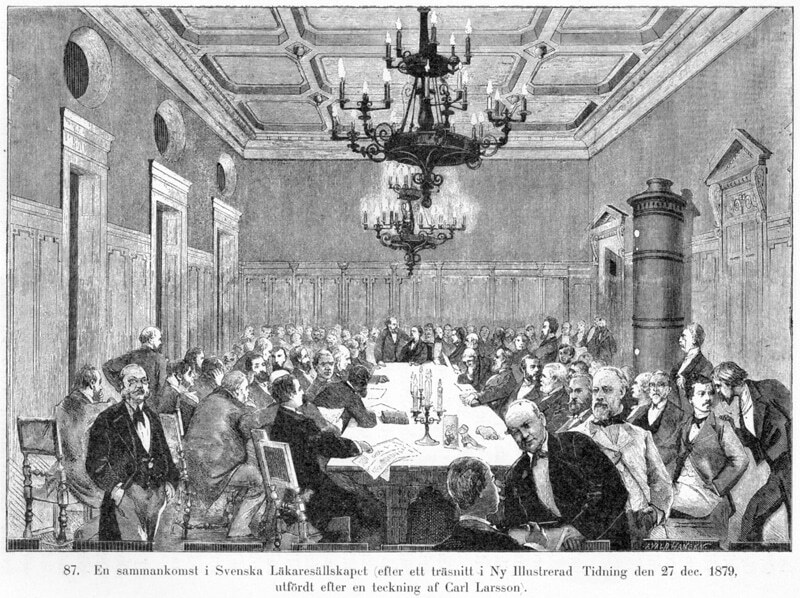 At the end of the 19th century there was only one Swedish society for doctors, Svenska Läkaresällskapet, the Swedish Society of Medicine. It was founded in 1808 by the seven foremost physicians in Stockholm, among them Jöns Jacob Berzelius who also was a pioneer in chemistry. He discovered several elements and created the periodic system. The society was founded mainly to facilitate the group’s ability to obtain foreign medical literature. King Gustav IV Adolf feared that the ideas of the French Revolution would take hold in Sweden and had for that reason prohibited import of literature, particularly from France. The only periodical allowed into the country was the queen’s French fashion magazine. Two hundred years earlier, medicine had not been in great favor among the learned in Sweden. The pay was low, and not many studied medicine. During the 18th century things changed, especially through the luster lent to the medical sciences at Uppsala University by Carl von Linné. The medical profession now became more popular among Swedish men, in contrast to the 17th century when it mostly had attracted ignorant, foreign rogues. Along with the increase in the numbers of medical students there was an important development in the surgical profession. The many difficult wars during the 17th century made it necessary to nurse the wounded in the field—a task for the barber-surgeon. The barber-surgeons belonged to the barber guild, which gave its members the authority to trim hair and beards as well as to bandage wounds. During the 18th century there was a constant conflict between the medicine profession and the surgeons, since the latter wanted to keep their guild privileges and at the same time expand into scientific medicine. In 1797 the medicine profession and the surgeons merged into a joint profession, a decision that also prepared the way for the Swedish Society of Medicine. The purpose of the society was to gather Swedish physicians and by this to encourage scientific progress, and through common experiences make medicine easier and safer to practice. Its first statutes from 1808 state “the Swedish Society of Medicine appoints as Corresponding members physicians, foreign and Swedish, who (either through their own merit or through a work beneficial to the Society) can contribute to its purpose.” The term “corresponding member” was changed in the statutes a decade later, but may have lived on informally: as late as 1979, the term was used again in revised statutes of the society. In the statutes from 1819 the new term was instead “foreign members.” According to custom of the time foreign physicians sent, together with an enclosed curriculum vitae, a request for membership in the society. This custom, which sometimes led to acceptance and sometimes did not, went on for many years. Not just any foreign doctor was accepted by the society. Among the first ones were the inventor of vaccination Edward Jenner, the eminent German physician Christian Wilhelm Hufeland, the famous British surgeon Astley Cooper, and the French pioneering physiologist François Magendie. The society maintained a high standard when inviting foreign members to join. At the beginning of the 1880s, the society had about 360 Swedish members and almost 170 foreign members. Of the seventeen foreign members who were elected in 1882, all were professors. From the start, the dominant branch of medical science was anatomical pathology, the theoretical discipline that comes closest to practical medical science. The 19th century was on the whole the big century for anatomical pathology, during which French and particularly German and Austrian pathologists made a great impact on the subject in Sweden. Johannes Müller’s and Theodor Schwann’s discovery of the animal cell formed the basis of the knowledge about anatomical pathology, and Müller worked closely with the Swedish scientist Anders Retzius. The first Swedish anatomical pathologist was Axel Key, born in 1832. After he had completed his education, Key made a long study tour of Germany in 1860–1861. In Berlin he studied anatomical pathology for nine months with Rudolf Virchow, a disciple of Müller. Virchow, known as the father of pathology, was one of the greatest representatives of the medical arts of the 19th century. After Key returned to Sweden in 1862, he became a professor in anatomical pathology at Karolinska Institutet in Stockholm, a chair he held for 35 years until retiring in 1897. He died just a few years later, in 1901. Axel Key was one of the most important persons in Swedish medical research of the late 19th century. For a decade he was headmaster of Karolinska Institutet, he founded the journal Nordiskt Medicinskt Arkiv (Nordic Medical Archive), and he was very interested in international relations and joint research. He was president of the Swedish Society of Medicine in 1870–1871 and 1879–1880, and for many decades filled leading positions. He was intelligent, eloquent, and enthusiastic. Even if the election process in itself was a democratic one, someone of Axel Key’s importance would of course have a great deal of say when it came to accepting new members. According to the revised statutes from 1874, the members were registered Swedish doctors and pharmacists who had applied for membership and been approved, as well as elected Swedish and foreign doctors, scientists, etc. To be elected to the society, a prospective member needed sponsorship in writing from two members; the proposal was announced within the society, and, one month later, voting took place. Two thirds of the voters had to approve the candidate. The newly chosen member received a diploma from the secretary. There was no annual membership fee. With his knowledge of everything that happened internationally, especially within pathology, Key would of course not miss the fact that a young British doctor had won the Jackson Prize. Key’s own specialty was anatomical pathology, but his teacher in Berlin, Virchow, was also the father of comparative pathology, and surely Key had acquired some knowledge of this subject, which is the pathology of animal diseases in relation to human pathology. Mortimer’s Jackson Prize essay was “Is Disease a Reversion?” and he wrote two more papers closely related to the same topic, “Some Freaks of Atavism” and “Do We Progress?” Atavism had its glory days during the latter part of the 19th century and signifies the tendency to revert to ancestral type, an evolutionary throwback with traits reappearing that had disappeared generations ago. A lot of the atavism research concentrated on animals, which makes it partly related to comparative pathology. The Italian criminologist Cesare Lombroso used atavism to identify physical characteristics common to criminals. Lombroso was in some ways, but maybe not scientifically, a predecessor to Alphonse Bertillon—the only man Mortimer thought a greater crime expert than Holmes. Axel Key must have known about Mortimer’s award-winning essay, and he would also have been aware of Mortimer’s papers. An important part of the work in the society was to read and review foreign medical books and journals. Axel Key and his colleagues must have noted that Mortimer’s papers in the Lancet and the Journal of Psychology in one way or another were extraordinary. Otherwise Mortimer would never have been suggested as a foreign, corresponding member of the society. He was after all nothing more than a senior student at the time, and all the others who were elected to the society were doctors with long curricula vitae or important positions. Another person who hardly could have missed Mortimer’s writings was, of course, the father of comparative pathology himself, Rudolf Virchow, who lived until 1902 and with whom Axel Key had frequent correspondence. Virchow most certainly read what was written in his own field, especially when it was an award-winning essay. Maybe Mortimer had visited him in Berlin; maybe they at least corresponded. There is another interesting connection between Mortimer and Virchow, since Virchow was a famous anthropologist, particularly concerning the human cranium—Mortimer’s interest in the same thing is evident at the beginning of The Hound of the Baskervilles. It seems probable that either Axel Key or Rudolf Virchow knew of Mortimer’s work. If it was Virchow, he could easily have made his former student Key aware of what a brilliant mind Mortimer had, even if his curriculum vitae in other ways wasn’t that impressive yet. During the 1870s and 1880s no other member with this specialist knowledge was elected to the society, so Dr. Mortimer could surely have proven himself useful. If that was the case, when was Mortimer elected? Certainly not before 1881 and probably not after 1884. Presumably he was awarded the Jackson Prize sometime during this period, and this was also the time when his papers were published. These years were the culmination of his scientific career, and after 1884 his research had either ebbed away or not been made public. If he wasn’t publicly active after 1884 it is easy to imagine that his name would have been forgotten quickly by Key and Virchow—no matter how brilliant he was—if the society at that point hadn’t already made him a member. Considering his youth and how unestablished he was when elected, it is likely that it wasn’t just the Jackson Prize that made him a corresponding member of the Swedish Society of Medicine, but also thanks to the two papers that the final decision was made. 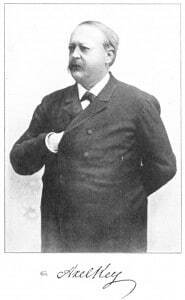 Thus, he was elected in late 1883 or during 1884. During this time he got married, left the Charing Cross Hospital—and by that his scientific life—and moved to Dartmoor. Since his year was so turbulent, it’s no wonder that he didn’t pay sufficient attention to this membership invitation from the Swedish Society of Medicine—and how much it really meant. Maybe he even lost the diploma when moving; such things happen to all of us, and if you can lose a walking-stick you can lose a diploma. So when the Medical Directory later collected updates he couldn’t remember more than the fact that it was a Swedish society interested in pathology, or in his own words, the Swedish Pathological Society. Let us hope that this “dabbler in science” succeeded in finding the good life down on Dartmoor, at such a great distance from the academic world. At least he found a like-minded man in Sir Charles: “many a charming evening we have spent together discussing the comparative anatomy of the Bushman and the Hottentot.” But after the death of Sir Charles? With whom could he then discuss science? 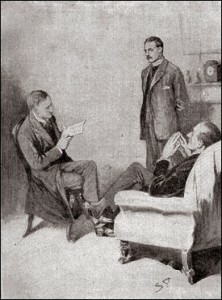 No wonder that he was so eager to examine Sherlock Holmes’s skull—the poor scientist seemed totally under-stimulated. Or maybe he just realized in his humility that life doesn’t always turn out the way you thought it would. He then thought about how strange it was that he could have missed the resemblance between Stapleton and the picture of Hugo Baskerville. After all, it was just the kind of atavism that he had studied when he was a student, an eternity ago. But it no longer mattered, not now when the case was closed, and he could lean back in his armchair in his Dartmoor home, with his wife at his side and a newly bought little spaniel puppy playing on the floor, while his thoughts drifted away to the shells on a far and distant seashore, and a great unknown ocean. Henschen, Folke, Patologiska Anatomiens Historia i Stockholm, Stockholm: Almqvist & Wiksell International, 1977. Lennmalm, Frithiof, Svenska Läkaresällskapets Historia 1808–1908, Stockholm: Svenska Läkaresällskapets handlingar, band 38, 1908. Redfearn, Auberon, “Mortimer: His Medicine, His Mind, and His Marriage,” in Hound and Horse: A Dartmoor Commonplace Book edited by Shirley Purves, London: Sherlock Holmes Society of London, 1992, pp. 40–43. Svenska Läkaresällskapet 1808–1908: Porträtt och Biografier, Stockholm: Tullberg, 1909.